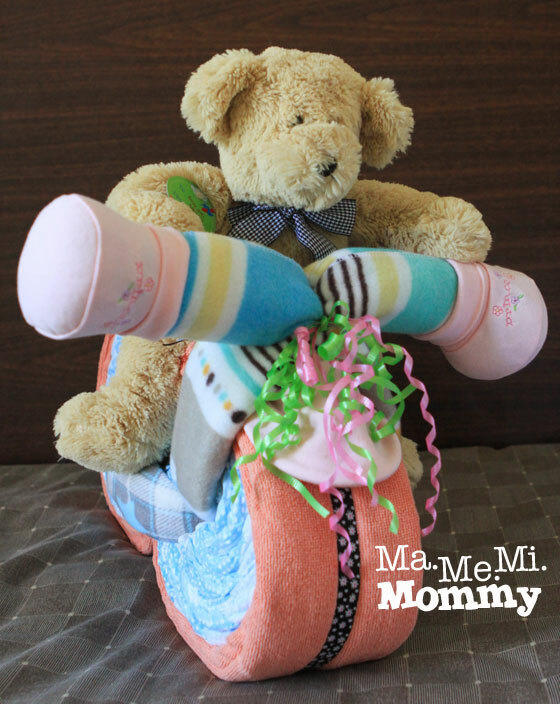 Anyway, on both occasions, I prepared a diaper cake motorcycle like the one below as a gift. Each has gotten its fair share of oohs and ahhs and I’ve gotten a lot of requests to post a tutorial so here goes. 1. 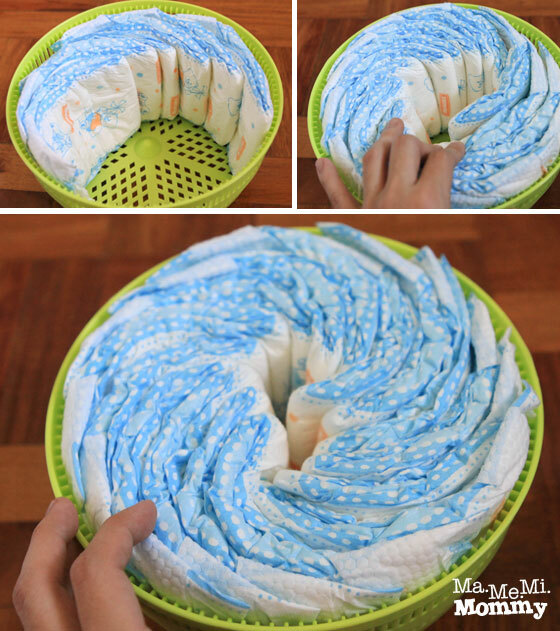 Arrange the diapers in the colander/pan like a fan. 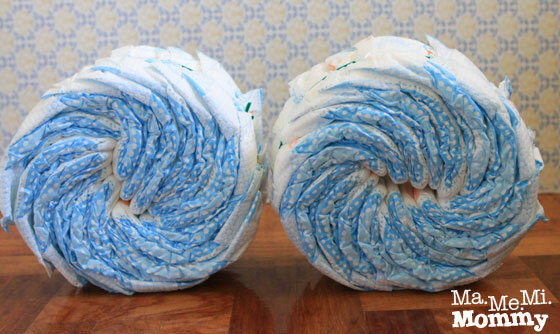 I used 15 diapers for each wheel. 2. 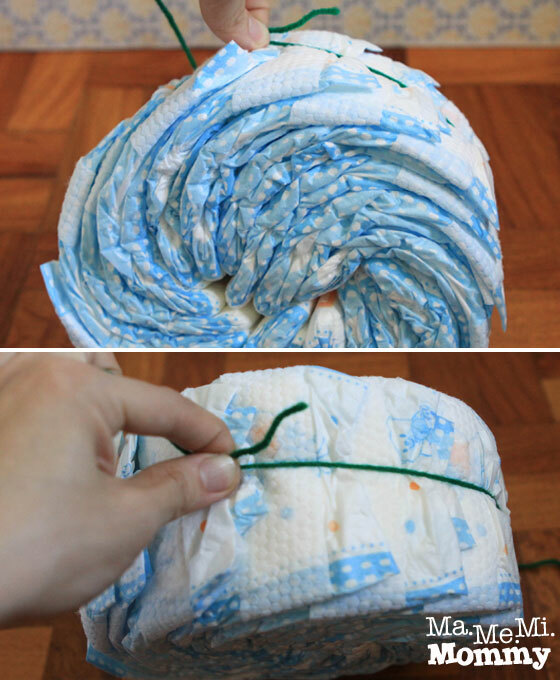 Slide the diapers out carefully and tie a string or rubber band to hold them together. 3. Repeat the same process for the second wheel. 4. 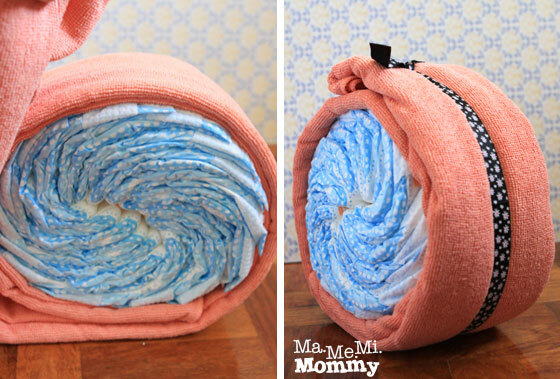 Fold the bath towel into the same width as the diaper (around 4 inches) and roll it around the diapers. Fasten with a decorative ribbon. 5. Do the same for the other wheel. 6. 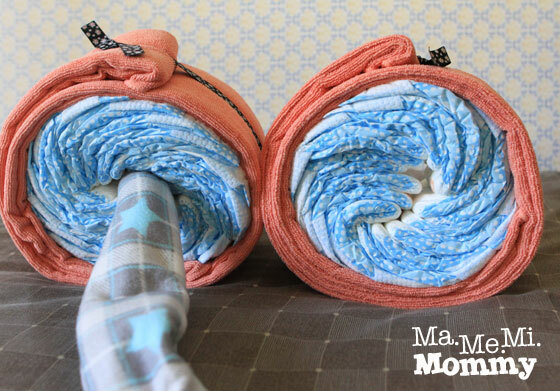 Roll up one of the baby blankets and insert into the middle of the diapers. 7. Connect the two wheels together. 8. 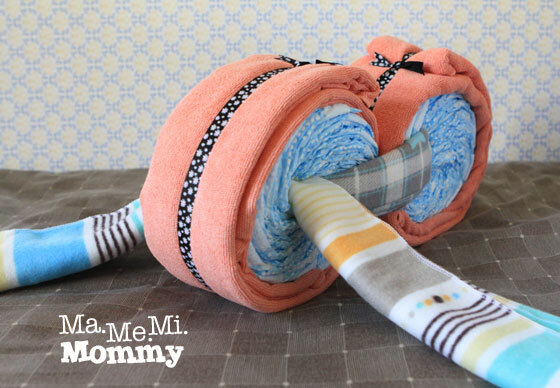 Roll up the other baby blanket and insert it into the front wheel. 9. Bring the ends up over the wheel and tie a ribbon to fasten. 10. 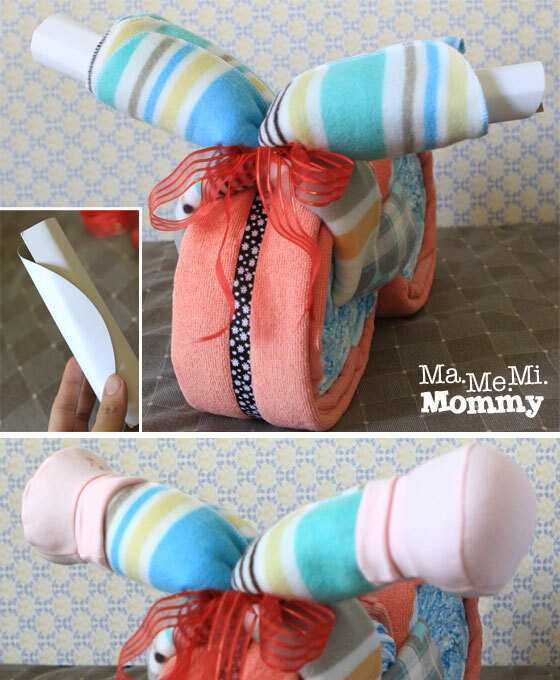 Roll up two cardboards and insert into each side of the baby blanket to form the handlebars. Top each side with the baby booties. 11. Place the stuffed toy on top to make it seem like it’s driving the motorcycle. I changed the red ribbon above into these curled up ones. Looks so much nicer, right? The handlebars needed some support so I placed a baby bottle in the space between where the knot was tied and the wheel to better hold it up. I then covered it with the baby bonnet for effect. How does it look? Thanks for sharing this tutorial! 🙂 I’ve always wanted to try this before I gave birth. Naisipin ko lang regaluhan sarili ko dati! ahaha! Weird , yes. 😀 NO seriously, I wanted to make this sana for my baby’s baptism kaso parang ang hirap tignan. Pero ang galing ng tutorial mo 🙂 parang ang dali lang sundan. I think pwede ko pa naman ata to gawin sa 1st bday ni baby. I love it! Sana merong baby shower akong maattendan para magkaroon ng reason gumawa neto! He He He. Wow, I love this! My BFF is actually very good at doing diaper cakes and other diaper decors. She’s been doing it for many baby showers for years now. I don’t have the same crafty hands, heehee. love this! keeping this in mind. 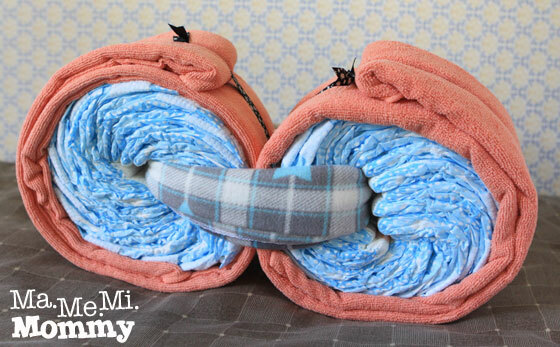 creative and useful gift! Love love love this. I remember this motorcycle diaper. The baby was riding it on the last photo I saw. Hihihi! Grabe sobrang ganda nya. Galing! Uy, galing! 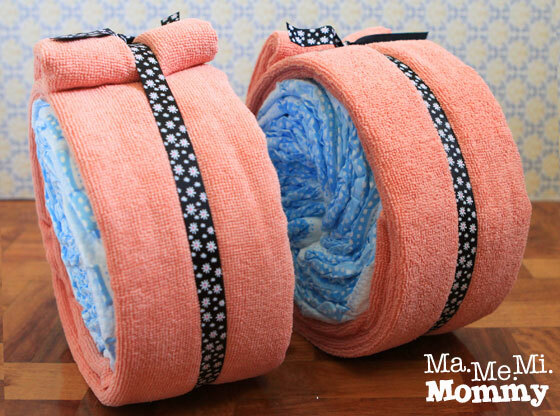 I’ve always wondered how to make those diaper cakes. 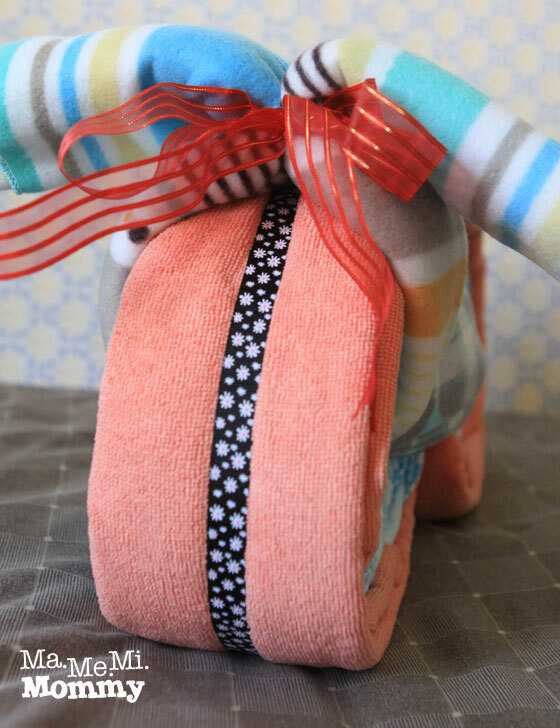 What a lovely baby shower gift! Such creativity! You’re so talented, sis! Mayu recently posted…Free Doughnuts on #‎KrispyKremeAt1000‬!